For busy chefs in bustling kitchens, ready to use, chilled and ambient sauces are life-savers. Or time savers. Let’s not exaggerate. But really, they can make the difference between a chaotic and disorganised service and a calm and successful backstage restaurant experience. Every chef knows that harmony and order are the cornerstones of creating delicious meals and valuable reputations. For professional kitchen teams looking for efficient and cost effective ways to save time and free up some precious pairs of hands, buying readymade sauces is often the answer. But google ‘UK sauce manufacturer’ and you’ll find there are many of us vying for your business. Trust us, we’re all lovely, but how do you, as a customer, select the best service to support your own business. We’re very English and singing our own praises is not something that comes naturally; however, in the interest of fairness, we will try to give you an honest and well-rounded appraisal of what we do best – and why you should come to us for all your sauce manufacturing needs. Quattro Foods manufactures and supplies great tasting bespoke sauces for restaurants, food manufacturers, the NHS, the Army and food service providers. With various packaging options, specialist ingredients, years of industry expertise and a commitment to exceptional customer service, our chilled sauces and ambient sauces are delicious, varied and offer true convenience. At Quattro, we have been developing and producing sauces, dips and condiments, chutneys and compotes for the restaurant and retail market for many years. Our products can be supplied chilled or frozen in all packaging formats, in pouches, jars and bulk quantities. Our love of food and knowledge of international culinary trends, coupled with our BRC AA grade, ensures that our service, products and processes are consistently outstanding. – Are they reliable? We mean in terms of taste and customer service – equally! – Is the price right? Value for money should always be a consideration and at Quattro we cater for small or bulk orders, offering the customer bespoke packages to suit different budgets. – We are here to make your life simpler. 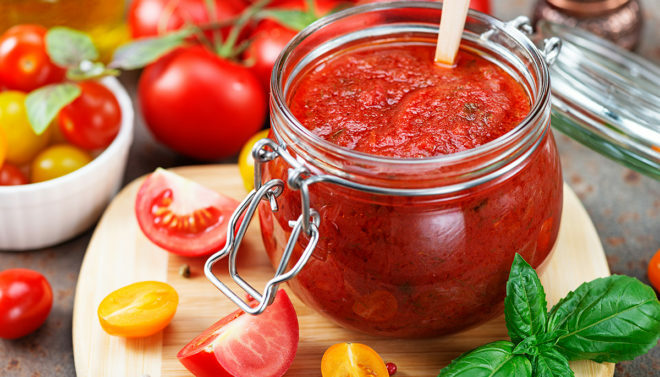 Convenience is key to choosing your ideal sauce manufacturer. Let our chefs do the ingredient preparation, weighing, stirring, cooking and tasting, to save you precious hours and manpower in the kitchen. – A truly diverse and extensive range is essential to ensure the needs of every one of our customers – and yours – is met. – Always research the production methods of your chosen sauce manufacturer. At Quattro Foods our traditional home style cooking processes result in delicious food. – And finally – the most important factors of all – quality and taste. Every sauce should be delicious and should not betray convenience or value for money. At Quattro Foods one of our overarching priorities is flavour. So do you feel ready to choose your sauce manufacturer? If you’re still undecided, we’d love to chat. Pick up the phone and we can answer any questions. We look forward to hearing from you!